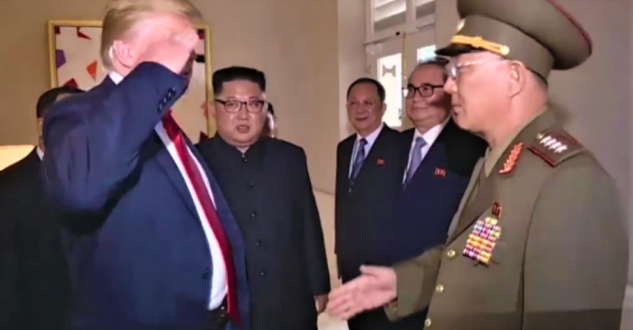 NORTH KOREA: State TV Shows Trump Saluting A North Korean Military Officer Because Of Course [VIDEO] - Joe.My.God. North Korean state media early Tuesday broadcast the first video of President Trump’s historic summit with Kim Jong Un in the country, including footage of Trump saluting a North Korean officer. In parts of the lengthy, 42-minute long video from North Korea’s KCTV news channel, Kim can be seen shaking Trump’s hand before the president turns to shake the hand of a North Korean officer standing next to Kim. The officer, confused, salutes Trump instead, prompting the president to salute back. U.S. presidents generally salute U.S. service members, but do not salute members of other nation’s militaries.